Has anyone experience with Sensing Labs devices? I have bought a bunch of Sensing Labs temperature/humidity sensors for research purposes. According to the data sheet the devices should work with any public network, but there is no documentation of the required AppKey. I have only found the DevEUI, which is printed on the device. The preconfigured AppEUI seems to be 70B3D580A0000000 for all devices, that is what I got from the OTAA join request on my gateway. Of course I cannot register the devices without knowing the secret AppKey. 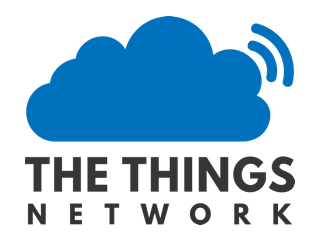 I bought the devices from the ThingPark market, so they might be preconfigured for the Actility network. Does anyone have an idea how to program new keys into the device or to read out the AppKey? There is at least an I2C header on the PCB so there might be an EEPROM or MCU that can be accessed. It is almost a year since you posted this on the Forum. How did you get on? I have just received a Sensing-Labs SL-Gateway (Pico) and a TEM-LAB-41NS temperature sensor but I cannot get them working! My issues with those Sensing Labs devices are also still unresolved. My biggest problem was that I could not even contact them via their website. Perhaps you have been more lucky. If so, I would like to hear about that. What problems do you have with the Multitech gateway? I set up a few of them (but with mLinux instead of AEP), and they all worked fine with TTN. So did my test nodes, provided that the keys were programmed correctly. I have connected my LoRaWAN Radio transmitter Sensing Labs A (4-20ma Input) to one 4-20ma water pressure sensor (0…400bar). I saw the widget graph as current (unit mA), my aim is to show pressure values in widget in bar or hpa. I need to decode last 2x bytes of the uplink payload (00 F9 8E 01 9C 10 05 D1) received from the Sensing Lab Tx to % value and convert to hPa or bar values and associate it to Cayenne widget graphs. 20mA (100%) = 400bar (it depends of the pressure. I see the 05D1 in the “UPLINK payload (00 F9 8E 01 9C 10 05 D1)” , but what is the exact value that this 05D1 should be converted into? If it’s linear (is it? ), then subtract 4 and multiply by 400 / (20 - 4), so: subtract 4 and multiply the result by 25? However, I’ve not used Cayenne so no idea if one can use TTN Console payload functions to do any of that before passing it along to Cayenne. Or if one can do this in Cayenne directly. But as it seems you already see some data on Cayenne, I guess you already decoded that hexadecimal 0x05D1 into some mA reading between decimal 4 and 20 mA, so maybe you really only need to do the scaling for values between 4 and 20? //decoding last 2x bytes "05 D1"
Attached us the user guide. The last two bytes are input current expressed in 1/200ma as 2 bytes unsigned MSB int. Can I use this code. Shouldn’t the cayenne widget appears with pressure values instead of current? 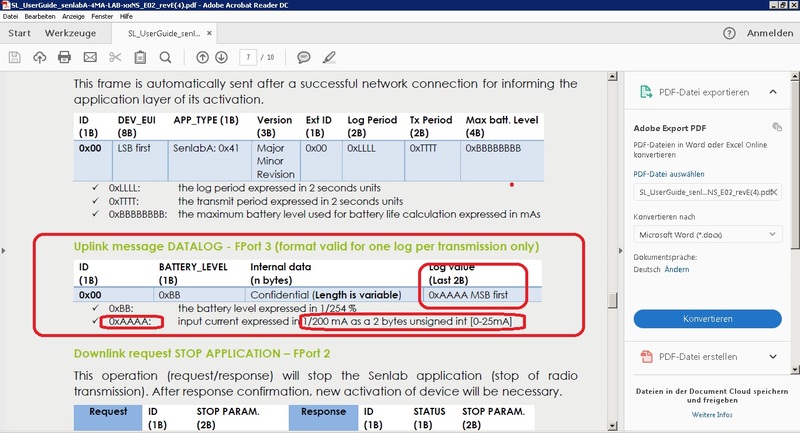 Attached is the User guide of sensing Labs, concerned chapter is Uplink DATALOG FPort3. Please correct me if I am wrong, should I now replace the last 4x bytes with Cayenne LPP payload format to have like: 05 73 05 D1 in order to get correct widget pressure in Cayenne Tool? 05 D1= current value in ma which will be decoded to pressure value as per Decoder function mentioned above. Noob question. How did you get your SenLab sensors activated? I got mine registered, but it says in the instructions that after registration you are redirected to the new device where you can get your app key to activate the device. How do I go about doing that?